TopBraid EDG–Metadata Management (TopBraid EDG–MM) lets organizations govern information about their data assets, software applications, infrastructure, business capabilities and processes. 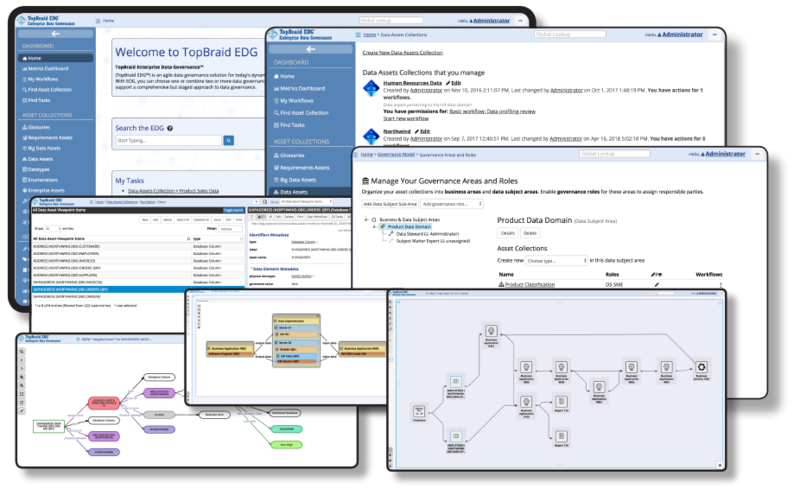 TopBraid EDG–MM is key to managing enterprise data as assets and to understanding the lineage of the data and its metadata. The data landscape is changing faster than before. Big data, legacy data, external data, internal data, data of data and much more; organizations today use all possible types of data because they can and because doing so creates value. Increasing diversity also creates an increasing challenge of managing different types of data from various sources. It has become harder than ever to get a holistic view of the data ecosystem and also to get a detailed understanding of the data lineage, data use and impact. How Can TopBraid EDG–MM Help? Data, Technical and Enterprise Asset Collections –catalogs of resources that make up a data ecosystem. These include: data asset collections or data dictionaries cataloging databases, data elements and datasets, technical asset collections cataloging systems, business applications and technical hardware and enterprise asset collections cataloging business functions, activities, processes and information assets such as documents, forms and reports. Business Glossaries – catalogs of terms that provide business context for data. Lineage Models – assets in any collection can already be directly linked with each other to, for example, say that a business application stores data in some database. Lineage Models are used when there is a need for a more detailed specification of data transformations as it flows between data sources and applications to users, in support of business activities and functions. Requirements – catalogs of relevant requirements such as data requirements, regulatory requirements and security requirements to support traceability of requirements to other EDG-managed assets. Intuitive Graphical User Interface – with auto-completion, drag and drop and rich text editing. Flexible Data Model – ability to define and use any number of custom attributes and relationships for data and other assets. Role Based Views – different users can have different views of assets as determined by their governance roles. Configurable Governance Roles – for business areas and data domains as well as individual assets. Reporting and Dashboards – Built-in reports and configurable role-based governance metrics. Advanced query-building tools and reporting through graphical interfaces. Visual dashboards to explore and drill down lineage, traceability and impact information. Search – simple lookups and advanced search, saved searches and search services. Data Quality Rules – built-in, out of the box rules and constraints. Custom validation rules necessary to enforce best practices and ensure high quality of your information. Profiling of Data Sources – automated cataloging of data sources. Import/Export – Data ingestion and export from/to from Spreadsheets, Databases, XML, SPARQL and GraphQL endpoints. Enterprise-readiness – Easily extensible, highly scalable and robust architecture with high availability, single sign-on through LDAP/Active Directory integration, integration with enterprise systems through built-in connectors, web services and JMS. Learn how to manage your enterprise data while understanding the lineage of the data and its metadata. Learn how to improve the quality of your data, so you can trust that the data is accurate. Comprehensive, packaged data governance solutions make it possible for you to manage a complete range of assets and use cases. Learn how TopBraid EDG lets you manage metadata across all your data sources, irrespective of their location, structure and format. Combine EDG–RDM package with metadata management to bring consistency and accuracy to the use of your reference data. Learn how understanding data lineage is necessary to meet regulatory compliance and other business requirements. Learn more about Information management and governance in the enterprise context.